The beginning of a New Year starts with reviewing artists’ schedules and pitching for fill-in dates. Sending out Press Releases to media to promote a concert and community event is always ongoing. Check out my Facebook page for more up to date info on shows I am promoting! 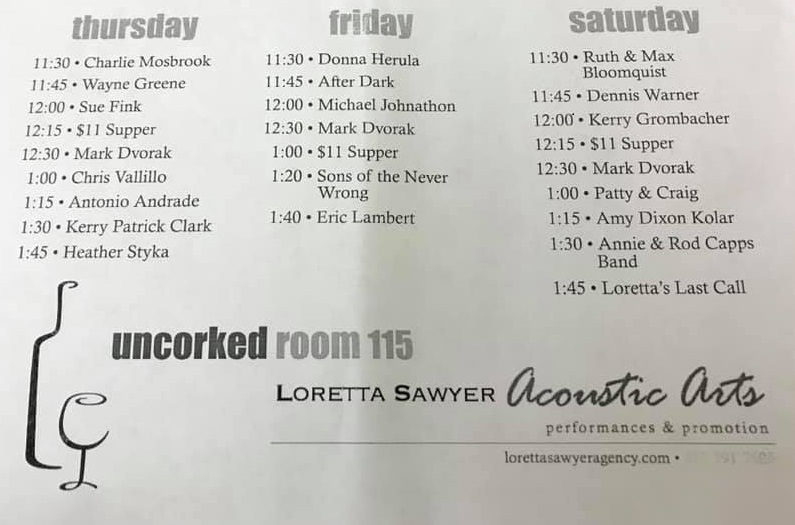 Loretta Sawyer Acoustic Arts will be hosting the Uncorked showcase room at the SERFA (South East Region Folk Alliance) Conference in Chattanooga, TN May 16 & 17. Stay tuned for the schedule of amazing artists I will be presenting at this conference. Mark Dvorak continues to have a full schedule which he balances between traveling to concerts, teaching, and performing for many community events. Loretta Sawyer Acoustic Arts provides press releases for his various performances and works on connecting him with new music venues to fill out his tour schedule. Michael Johnathon has released two new projects, Dazed & Confuzed and Songs of Rural America. “The Statue” music video, a song about hate, violence and the symbols of racism in America, with Lesson plans available is from the Dazed & Confuzed: 21st Century Folksinger album. The Songs of Rural America album was recorded live with the Ohio Valley Symphony orchestra and debuted as a TV event on RFD-TV on February 22nd. 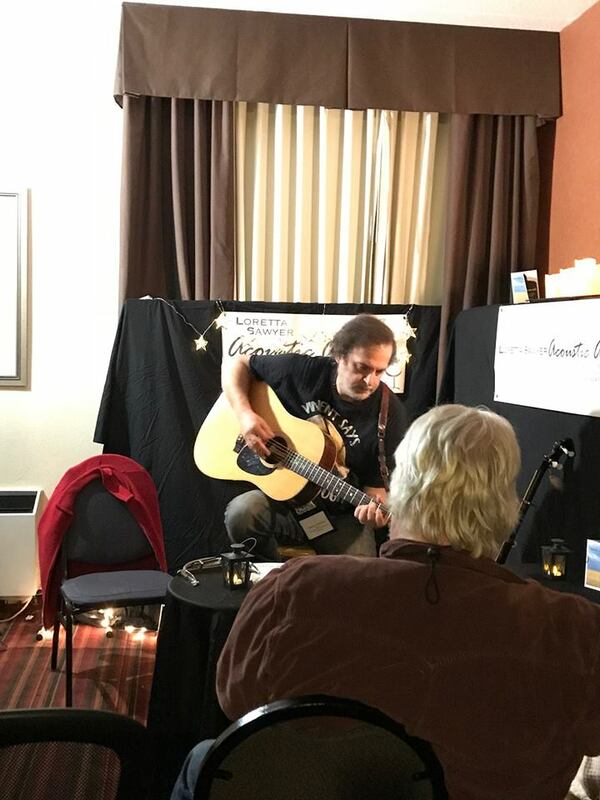 This entry was posted in live performances, Mark Dvorak, Michael Johnathon, music on March 20, 2019 by admin. Loretta Sawyer Acoustic Arts headed to the NERFA – Northeast Region Folk Alliance Conference in Stamford CT November 8-11. LSAA hosted the Uncorked showcase on Thursday and Friday nights, presenting an outstanding lineup of artists who “uncorked” their songs and stories during the late night guerilla sessions. I was also pleased to present Chicago singer songwriter Mark Dvorak to the NERFA community. Mark last appeared at NERFA in 2011 and had some exciting new material to share. It was also great meeting folks at the Loretta Sawyer Acoustic Arts booth in the exhibit hall at the conference. This entry was posted in live performances, Mark Dvorak, music on December 10, 2018 by admin. 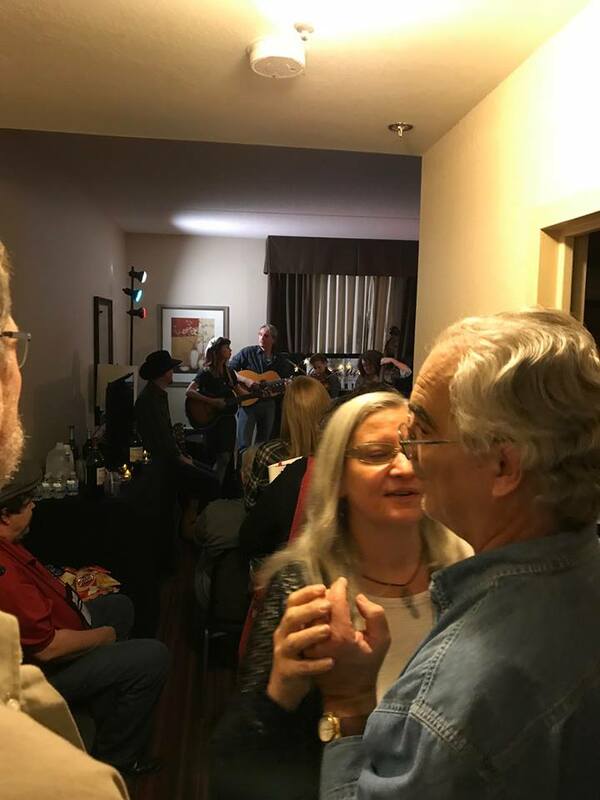 Folk Alliance Region Midwest (FARM) Conference friends….WOW…what a weekend Oct 25-28! I need to thank Smitty, Annie, the board members and volunteers who worked so hard to give us a fabulous weekend of music and friends. 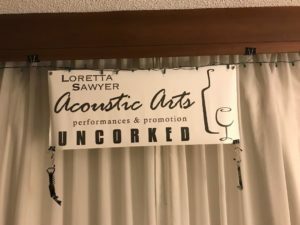 Thanks to all the artists who played in the Uncorked showcase hosted by Loretta Sawyer Acoustic Arts… you filled the room to the max each night. Special thanks to Mark Dvorak… It would not be Uncorked without him… He also brought $11 Supper to the FARM family table What a fun trio. Thanks to those who stopped by the Uncorked room to listen…venues, DJs, friends,.. I am grateful for your support. This entry was posted in live performances, Mark Dvorak, Michael Johnathon, music on November 14, 2018 by admin. Region Midwest (FARM) in Grand Rapids, Michigan on Oct 25-27. We are looking forward to presenting these talented artists! This entry was posted in live performances, Mark Dvorak, Michael Johnathon, music on October 23, 2018 by admin. The Oak Park Arts District in Oak Park, Illinois will play host to three acoustic music events on Friday and Saturday, October 12 and 13, to support the Oak Park River Forest Food Pantry, Housing Forward and the Oak Park River Forest Community Foundation. The second annual event, FolkTober Fest, is presented by Music & Potlucks, a community organization dedicated to presenting cultural programs that directly benefit those in need. On Friday, October 12, 6;30 pm the FolkTober Fest Acoustic Jam takes place at District Kitchen and Tap, 220 Harrison Street. Players of all acoustic instruments, singers and listeners are invited to the free event. Donations to support the Oak Park River Forest Food Pantry, Housing Forward and the Oak Park Community Foundation will be accepted. On Saturday, October 13, from 2:00 pm – 4:00 pm the the FolkTober Fest Showcase will take place at Val’s halls Records, 239 Harrison Street. The free performance will feature acoustic performers and singer songwriters including $7.34 Supper, Acoustic Neighbors, Jeff Burke’s Jam Class, the Young Stracke All-Stars and others. Donations to support the Oak Park River Forest Food Pantry, Housing Forward and the Oak Park Community Foundation will be accepted. The Saturday, October 13 evening activities shift to The Buzz Cafe, 905 S. Lombard Avenue for a dinner show and a tribute to folk icon Pete Seeger. At 6:00 pm the dinner show entertainment will be provided by Oak Park’s own Dropped Notes String Band. The Buzz Cafe will create a special menu for the event and guests are welcome to bring along their own adult beverage. At 7:00 pm, A Tribute to Pete Seeger will be presented by Chicago’s “official troubadour” Mark Dvorak and the Power of Song Singers. The one-hour presentation will feature some of Seeger’s most memorable songs. “If I Had a Hammer,” “Where Have All the Flowers Gone?,” “Kisses Sweeter Than Wine,” “Turn, Turn, Turn” and others have become standard in the American folk repertoire. Donations to support the Oak Park River Forest Food Pantry, Housing Forward and the Oak Park Community Foundation will be accepted. Tickets to the Saturday evening event are $20 per adult. Reservations can be made at Brown Paper Tickets, event 3578160. For more information on the event or to make a donation contact musicandpotlucks@gmail.com. This entry was posted in benefit, live performances, Mark Dvorak, music on October 9, 2018 by admin. Summer certainly speeds by fast… it’s been a time of outdoor art fairs, festivals and events… and some fine indoor things too. Michael Johnathon returned to the Chicago area twice in one week. Lillie Kuzma hosted Michael for a concert at WDCB radio on July 10, prior to his on-air spot during her Folk Festival radio show. Michael returned to Concerts on the Creek in Rockford, IL July 14 for a night of stories and songs shared with a wonderful and generous audience. Michael has been writing, composing, and rehearsing for his “Songs of Rural America” concert. Michael will perform songs with a symphony orchestra. This will be recorded for public radio and filmed for public television. Be part of the WORLD PREMIER Performance Saturday Oct 6, 2018 at the historic Ariel Opera House in Gallipolis, OH. For more info visit http://www.michaeljohnathon.com/symphony/. Mark Dvorak’s schedule is always full. Check it out at www.markdvorak.com. 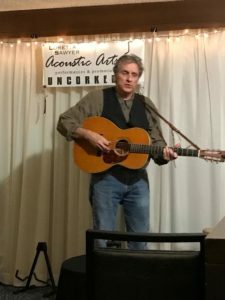 Mark was involved in three Oak Park Illinois Thursday Night Out Folk music events held monthly in June, July and August, showcasing some great Chicago area talent to the Oak Park community audience. Mark is also working with a new trio out of Old Town School called $11 Supper and has done several co-bills with them. They have been called “Chicago’s new vibrant acoustic trio.” You can check out their Facebook page for more info. 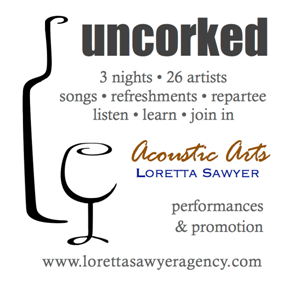 Loretta Sawyer Acoustic Arts will be going on road trips this fall and will be hosting the Uncorked late night showcase at two upcoming music conferences: FARM in Grand Rapids, MI and NERFA in Stamford, CT. LSAA is also a sponsor at FARM. See the Uncorked FARM banner here and on the FARM website. Watch this site for the Uncorked schedules for FARM and NERFA as soon as both are completed! Montreat NC, is where the 11th Annual South East Region Folk Alliance (SERFA) Music Conference was held May 17-20. We set out early Wednesday Morning from Chicago and made a stop in Knoxville TN for the night, after driving through three bouts of very heavy rain. Thursday Morning was an easy two hour drive to Montreat. 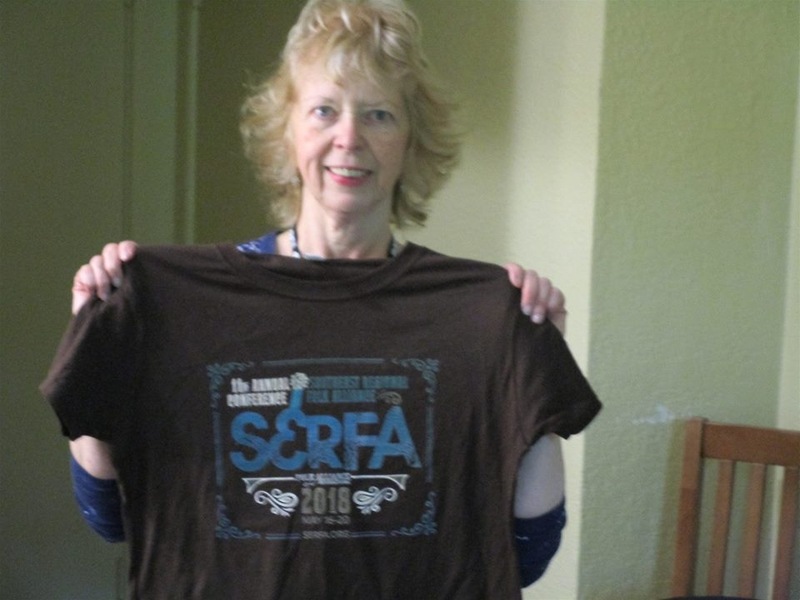 Loretta with the official SERFA T-shirt. 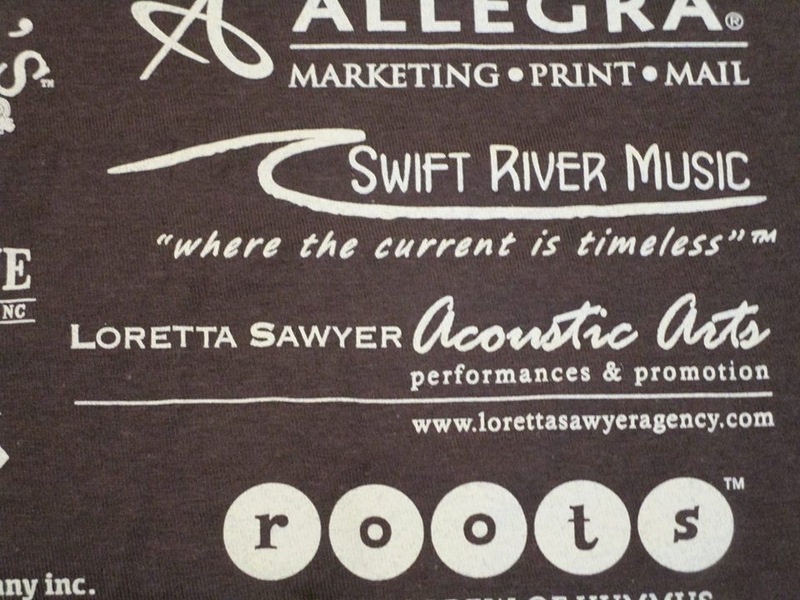 Loretta Sawyer Acoustic Arts was a SERFA Sponsor; very cool having the LSAA logo on the back of the SERFA T-shirt. LSAA hosted the Uncorked private showcase room for Thursday and Friday nights. Thanks to all the artists who shared their songs and stories in the Uncorked room. 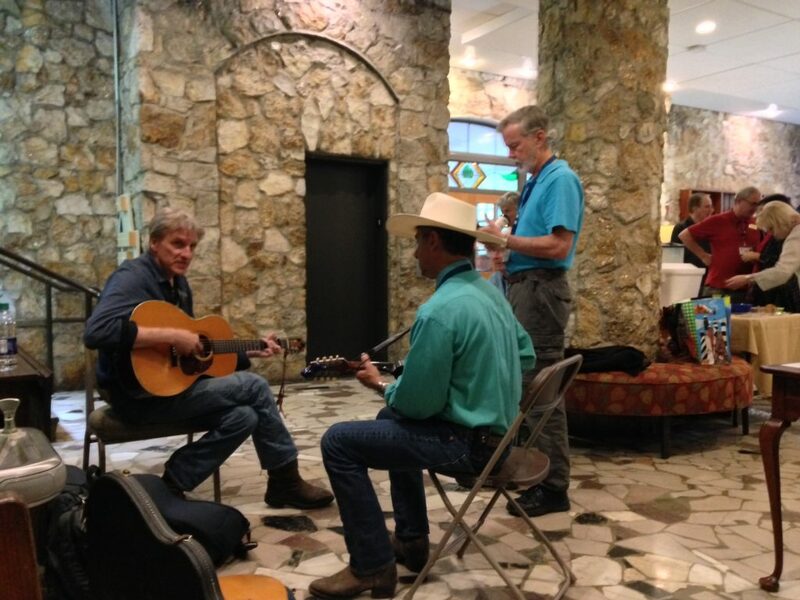 Mark Dvorak jams with conference attendees in the hotel lobby. Saturday was a vacation day and chance to get away for a bit. 45 minutes away in Flat Rock, NC is the home where Illinois born poet, writer, and editor Carl Sandburg lived his final very productive years. The Farm is called Connemara. Sunday was the 700 mile drive home in 11 hours. 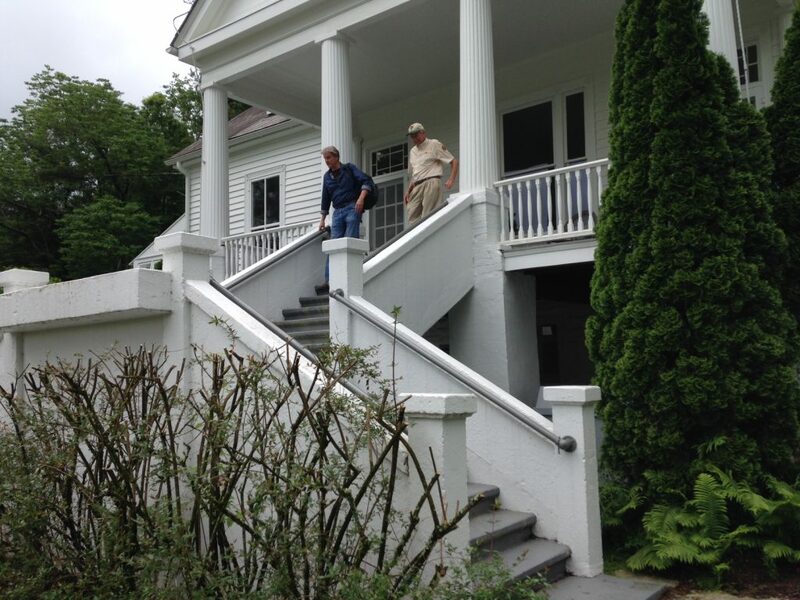 A visit to the Carl Sandburg Home, Flat Rock, NC. Thanks to Art Menius, the SERFA Board members/officers and volunteers for the wonderful conference. It promises to be a busy summer for Mark Dvorak. MD hits the road Thursday June 9 for a series of shows in Illinois, Tennessee, Ohio and Kentucky. 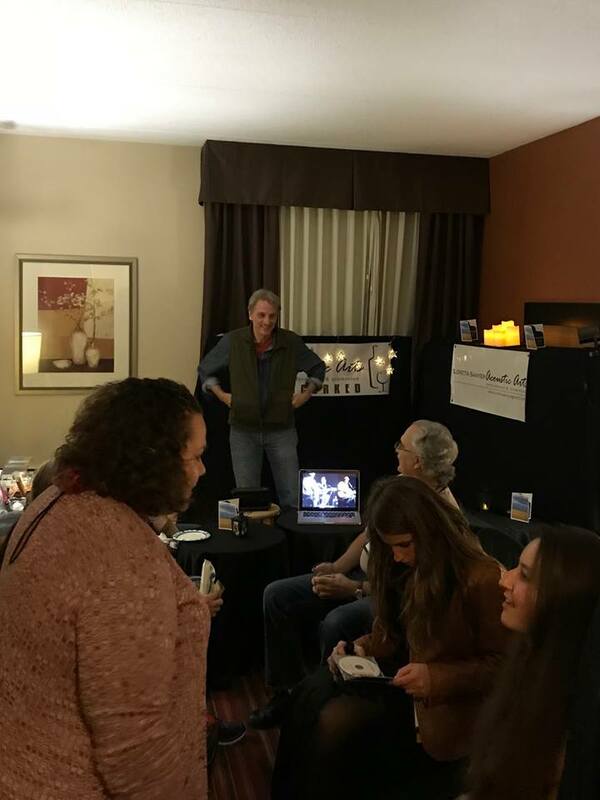 In concert: On Friday, June 15, MD makes a return visit to The 3rd Friday Coffeehouse in Somerset KY, and will make his second appearance at Charles and Myrtles Coffeehouse in Chattanooga TN on Saturday June 16. On the air: On Saturday, June 16 at 12:00 noon, MD makes his debut appearance on The Blue Plate Special hosted by Red Hickey. It’s a LIVE radio performance show before a LIVE audience in the WDVX Studios in the newly renovated Knoxville Visitors Center, Knoxville TN. At the fest: On June 9 and 10, MD makes his twentieth appearance at the Homeplace Pickin’ Party. Located on an historic 1840s working farm in the heart of Land Between the Lakes, the festival features music, demonstrations, food and jamming. MD joins the Dixie Volunteers, Common Thread and a host of other acoustic performers. Community Concert Partnership: Other appearances on the tour include Evergreen Place Assisted Living in Normal IL, Sayre Christian Village in Lexington KY and a private House Concert in Cincinnati OH along with other engagements still in the works. Get in touch to see how easy it is to bring Mark Dvorak to your performance series, venue or event. Learn more at Book Mark. Spring finally came to Chicago, been enjoying some very nice weather here. Planted flowers and tomatoes on the deck at LSAA Headquarters. Mark Dvorak continues to balance his full schedule with concerts, teaching and working on two new projects. Visit his website for more information and performance dates. There is always something new with Michael Johnathon. He just completed his first children’s book, Mousie HiWay : The Adventures of Banjo Mouse. The book and CD introduces bluegrass music and acoustic instruments to kids 3-12 years old. Fully illustrated with a story based on the song “Mousie HiWay,” it takes kids on a musical journey through the Appalachian Mountains as Banjo Mouse forms the Mousie HiWay Band. There is also The Songs of Rural American performance Saturday Oct 6, 2018 at the historic Ariel Opera House in Gallipolis, OH. This concert will be recorded for public radio and filmed for public television. Be part of the excitement and in the theatre audience! This is a fully orchestrated concert presenting the spirit, tradition and songs of rural America. Visit Michael’s website or call (740) 446-2787 for more info. The 2018 Gathering of SongFarmers member conference will be in historic Berea, Kentucky at the wonderful Berea Arena Theatre on Big Hill Road, right off I-75 south of Lexington. Great hotels, camping, cafes, music shoppes and hiking are all around! The conference will be full of workshops, song circles and musical fellowship. SongFarmers members get TWO FREE TICKETS to attend both days! This entry was posted in books, live performances, Mark Dvorak, Michael Johnathon, music, WoodSongs on May 7, 2018 by admin. Happy New Year! Here’s a look back at the recent months and a look forward at what we have planned for 2018 so far! The WoodSongs Front Porch Association held it’s annual SongFarmer Gathering at Shaker Village outside Lexington, KY onOctober 13 and 14th. Everyone enjoyed the music and especially the workshops. I was back in Chicago for two days and then headed to Iowa City, IA for the Folk Alliance Region Midwest (FARM) Conference Oct 19-22 . 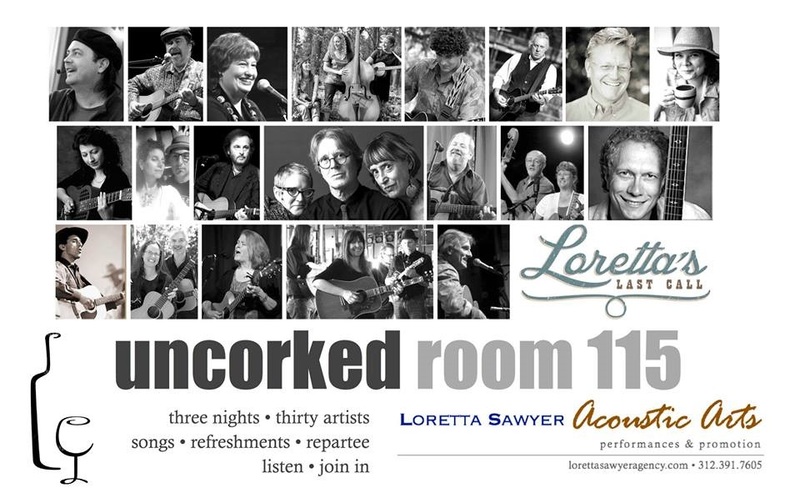 Loretta Sawyer Acoustic Arts hosted the Uncorked showcase room for three nights. Thanks to all the artists who performed in Uncorked: Mark Dvorak, Michael Johnathon, Rain Perry, Ruth & Max Bloomquist, River Breitbach, David Noll, The Matchsellers, Small Forest, CatBird, Dan Weber, Amelia Sweet Bluebird, Central Standard Time, John Keck, Blind Hills, Curtis & Loretta, Chris Vallillo, Patty Stevenson & Craig Siemsen, Chuck Mitchell, Tim Grimm, Eric Lambert, Diane Perry, Sandy Andina, Charlie Mosbrook, Lyal Strickland, Joel Curtis, Heather Styka and Ryanhood. Loretta Sawyer Acoustic Arts sponsored the Folk DJ/Venue Reception on Friday afternoon at the FARM Conference. 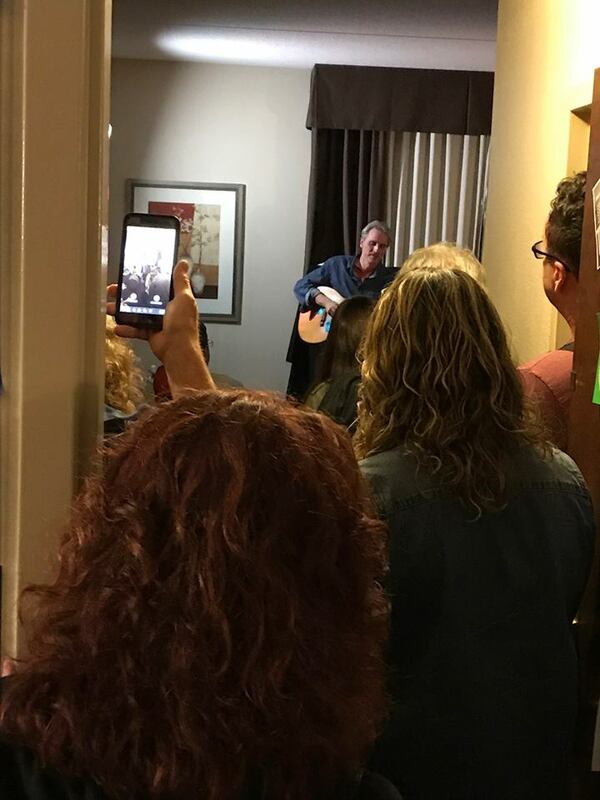 Mark Dvorak began the conference with a community sing and was an official showcase artist on Saturday evening. Michael Johnathon presented a workshop on SongFarmers. In 2018, FARM moves to Grand Rapids, MI. Thanks to FARM Board and Volunteers for another great conference. Arriving back to Chicago, it was my final guitar class for the Sept/Oct session, which was a performance song at the Old Town School of Folk Music. Turned out to be a duet of “Hallelujah” with my instructor Mark Dvorak. Yep, I was nervous, but Mark carried me through. I have no desire to perform in public, but like learning about songs and playing. By doing this I appreciate the talent of the amazing people I get to work with. My November/December Guitar 2 class ended last Thursday with another performance. Thanks to my classmates Bonnie and Hanna who supplied great guitar work and vocals to out performance song “Snowbird” and to our instructor Mark Dvorak for leading the way! Mark Dvorak continues to have a full schedule which he balances between traveling to concerts, teaching, and performing for library and senior events. Loretta Sawyer Acoustic Arts provides press releases for his various performances and works on connecting him with new music venues to fill out his tour schedule. Mark is working on his new project “Let Love Go On.” I think the song title says so much, as does the song. LSAA will also be working with additional artists supplying specialized CD distribution and publicity. May the New Year bring you many blessings, adventures and music! This entry was posted in live performances, Mark Dvorak, music on January 3, 2018 by admin.